Driven amongst others by the mobile phone applications, more and more statistics are becoming available on the state of water services. These go well beyond the coverage data we were used to in the JMP reports (and which this year gave us some reason to be mildly optimistic). The new stats provide more insight into the functionality of infrastructure and the level of service being provided. And these are saddening. Just have a glimpse at the overview of these sad stats made by Improve International. Though the specific figures differ from one country to another, but the order of magnitude of non-functional water points is around 30%, with another 10-20% being partial functional. Of the ones that are functional only a small percentage provides services that meet standards. Going a level deeper, one can find more details, such as the percentage of water committees that perform according to the standards. But the numbers repeat themselves with a significant percentage of those not performing well, or not collecting the necessary revenue to sustain operation and maintenance. We are probably all familiar with these and similar statistics, but seeing them listed like this really bring across the point that there is something rotten. The big question is of course how to deal with the bad news. Luckily, in this day and age, messengers of bad news no longer get shot, but few would get praise for providing sad stats. The European Court of Auditors at least didn’t get much praise for their work in water and sanitation. A few weeks ago it presented a performance audit of European Union Development Assistance for Drinking-Water Supply and Basic Sanitation in Sub-Saharan Countries. The full report presents the audit of the implementation of EC-supported water and sanitation projects in 6 African countries, and found very similar figures to the ones mentioned earlier. Most of the infrastructure was installed well and in working order, but conditions for sustainability were largely lacking, particularly in terms of financing and capacity of the service provider. The table below says it all – scoring lots of green on delivering the outputs, but orange and red for the likelihood on sustainability. The Auditor commends the procedures of the Commission to address sustainability issue, but suggests that these need to be followed more thoroughly. The response of the Commission can be found in the Annex to the document and is largely disappointing. It provides a long list of minor comments on specific issues. The most positive comment is that it welcomes the recommendations and promises to do better. The Commission doesn’t shoot the messenger but doesn’t seem to embrace its message either. The data would call for a more profound reflection on the approach taken. Arguably, the Commission is much better placed even than the Auditor to engage with the data and think through adjustments in its approach to do better. In reference to my previous blog, the Commission seems to be stuck in single loop learning, sticking to the existing procedures and trying to follow these in a better way. How different is the response of DGIS (the Dutch Directorate-General for International Cooperation) to a policy review of the Dutch contribution to drinking water and sanitation in 5 countries. 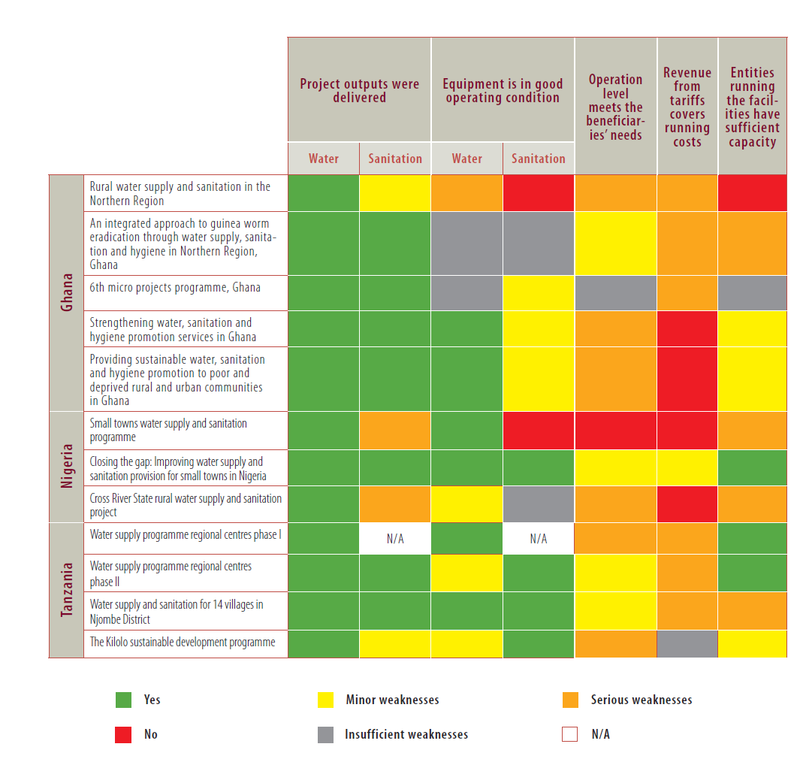 This report found similar type of data: good progress in infrastructure development, but problems with sustainability of service provision and poor water quality being delivered. Of course, this report was a more comprehensive and analytical report than the one by the Auditor, going into more depth on the underlying causes of poor performance and sustainability. But, DGIS also used it to critically reflect on its approaches. And, in the response (in Dutch) to Dutch parliament, it proposed a healthy mix of incremental and radical changes in its approaches so as to improve sustainability. The boldest one is arguably the sustainability clause, which would commit recipients of Dutch aid to be responsible for 10 year sustainability of service provision, a step that has already sparked lots of debate. Undoubtedly, the many exercises of water point mapping, monitoring of water and sanitation services and audits of water projects, will provide us with more sad stats. I do hope that we don’t get paralysed by them, or get into a defensive mode, but embrace the story they tell us and use them to think not only how we can do better, but also trigger us into new ways of thinking.